When it comes to buying Christmas presents it can all feel a bit overwhelming, can't it? The options are endless, so many ideas and potential gifts, but limited time to decide on which ones are perfect for your loved ones. This is where Wicked Uncle steps in when it comes to buying gifts for the children and teenagers in your life. Their easy to navigate website is filled with toys and games for babies all the way to teenagers, so you can get all your Christmas shopping for them done in one place. To make life even easier they offer a gift wrapping service and you can even add on a Christmas or Birthday card to your order for an addition cost. The children's gifts are split into boys, girls or all, depending on who you're buying for and you can also search by their age. This helps to make your shopping experience quicker, as you don't have to trawl through all of the gifts to find the ones suitable for the person you're thinking of buying for. I've used Wicked Uncle in the past and really like that you get a complimentary 'event reminder' email the following year, which works particularly well when buying for birthdays throughout the year. We have probably all been there with the dreaded 'I haven't got them a birthday present and it's today!' scenario, so receiving an email in advance of their birthday really helps to keep on top of everything. When you're browsing the Wicked Uncle website you can also search based on whether the recipient is an Adventurer, Outdoorsy, Brainiac, Wicked Fun, Engineer, Creative etc. Pop Up Pirate (£13.95) - This is a childhood classic and such a nostalgic game, with Blackbeard sitting in the top of the barrel waiting to pop out! Between 2 and 4 players can take it in turns to pull out one of the swords stuck into the barrel, pick the wrong one and Blackbeard will fly through the air. The slot that triggers Blackbeard changes every time, so you're kept on your toes and the anticipation is guaranteed to create lots of laughs. A fun game for the whole family to enjoy! Play Foam 20 Pack - No Mess Fun! (£21.95) - If you're a parent too then I think you'll agree that when something says 'no mess' in the title then we're onto a winner. Supporting children's imagination and creativity is really important, but the inevitable mess that comes with that can feel a bit daunting at times. Play Foam is an innovative and unique mess-free way for children to play, create and make. The Play Foam doesn't stick to hands, carpets or clothes and can be moulded into different shapes, then squished back together again for even more fun. It never dried out, so is the gift that keeps on giving and with eight fun colours included in this pack (four of which sparkle) your children can let their imaginations run wild. As there are twenty individually wrapped pods in a pack, they would make a good chocolate alternative advent calendar, by giving your child one pod of Play Foam a day they can gradually build up their collection throughout December. Street - Out of Control Mini Waboba Ball (£5.95) - Do you have a child that seemingly has far too much energy and never gets tired? Then the Street Waboba Ball could be the perfect Christmas gift for them, as it unpredictably bounces around making it harder than ever to catch again. It's fun graffiti design bounces off walls, floors, pavement or just about anything and the distance it can travel is impressive. You never know which way it will bounce next with it's ridged edges and unpredictable contours. It really will test the running power of energetic children and keep them entertained for hours. So there you have it, my top three Christmas gift picks for children from Wicked Uncle. If you're currently worrying about having enough time to get your Christmas shopping and wrapping done, then head over to Wicked Uncle. Which is your favourite gift from these three? These are great gifts. Mine would love to get their hands on the play foam they love the stuff. 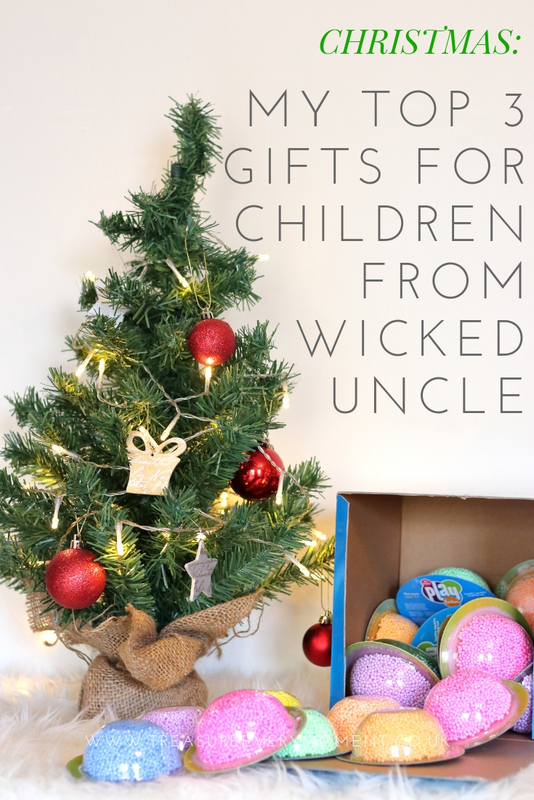 Wicked Uncle sure do have some fantastic products for children! They are definitely the brand I consider when buying toys for kids. I know that play foam is all the range at the moment and the pop up pirate looks like lots of fun - we love Wicked Uncle they have such a great range of unique gifts! We have used Wicked Uncle before. They have such a great selection of gifts and I found the service really good too. You're absolutely spot on! Anything that claims to be no mess is a massive win for me! My daughter loves playfoam! It's such a fun thing to play with on a wet winters day and I LOVE Pop Up Pirate! I had that when I was younger, I can't believe that it's still around! I've never heard of Wicked Uncle before, but my daughter would go mad for that ball! I think in our house, play foam would win by a mile off. Somehow my nephew is obsessed with the stuff.